« Summer is but a fleeting Moment! 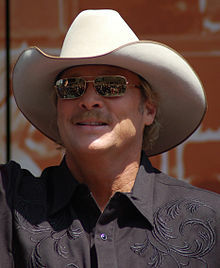 It was full steam ahead as Alan Jackson played to 3 sold out nights at the Mile One Centre in St. John’s recently. The multi award winner – too many to mention – wowed the crowd with all the fan favorites, while at the same time throwing out numerous guitar picks as souveniers. You name it, he sang it. From older favorites like ‘Don’t Rock the Jukebox’ to his heartwarming tribute to the 911 attacks ‘Where Were You When the World Stopped Turning’ to future favorites from his latest CD ‘Freight Train’. Jackson, who turns 52 this coming October 17th, was the true professional, entertaining the audience from the time he walked on stage with a bottle of water in his hand, to his encore, when he took the time to sign as many autographs as he could. This entry was posted on August 28, 2010 at 12:28 pm and is filed under Uncategorized. You can follow any responses to this entry through the RSS 2.0 feed. You can leave a response, or trackback from your own site.